I’ve shared a little secret about Thanksgiving over on the Mushroom Channel blog. Please don’t throw tomatoes at me. I’ve been called “un-American” in the past when I’ve told this little secret. 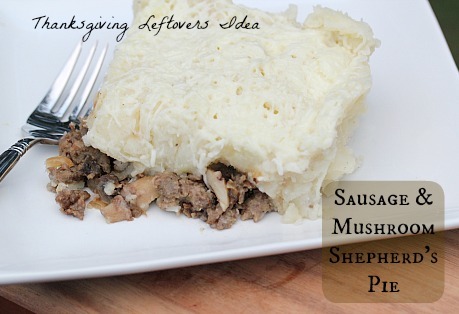 Head on over to the Mushroom Channel’s blog to find out…and get this scrumptious recipe for Sausage & Mushroom Shepherd’s Pie. Perfect way to use up those leftover mashed potatoes y’all! Disclosure: I’m a paid freelance writer for the Mushroom Channel blog. Recipe is my own, secret is my own. UN-American? Seriously? Because you don’t care for a certain food item? Man people are stupid. We are big on turkey here ans Thanksgiving is my favorite holiday. Go figure. This is perfect for my non-meat eater son! I substitute “meatless” sausage and he is a happy camper!